The city of Flint, MI (USA) just issued 8,002 foreclosure notices to residences that couldn’t or refused to pay past water bills. The water is poisoned with lead and can’t be used anyway. I told my friend at work that this was going to happen two months ago. Similar things happened in Pittsburgh, Philadelphia and my home town of Detroit. Working-class people have been forced out of their homes to pave the way for fancy condominiums for the rich. In Flint, the government made a big deal about their plan to replace the lead pipes by 2020. Under capitalism, this won’t benefit the workers who live there. It’s so developers can make huge profits. I used to visit Flint to roller-skate as I was growing up. But black kids like us could only go to certain areas and had to leave before dark. The racism was that intense. I lived in the Detroit Jeffries Projects. They were named after one of the most racist mayors in the city’s history. Black workers, many in auto, were forced into these projects. This industrial city of the 60s and 70s was one of the most segregated. It didn’t have to end this way. Flint plumbers called for union members throughout the state to work for free to get rid of the poisonous old lead-leaching pipes. Dozens responded. Imagine what a communist society could do. Even more would be mobilized, making short work of the repairs. In fact, it is unlikely we would face a tragedy like this. Clean water, not profits and budgets, would be our priority. There would be no developers as homes would be provided based on need, not what you can afford. We will produce what we need, not throw millions of people into the streets if the industries couldn’t make a profit. I know it’s hard for workers to understand, but our lives don’t have to be chained to the next paycheck. Communism would base everything on the needs of our class. *The May Day March with ICWP was definitely a good experience. The people there opened my eyes. I met people who immediately accepted me as family. I look forward to doing this next year. Even though I am not a communist I do believe that communism is a good life because I like the idea of everyone, no matter what, working together for what they need. I would like to join the ICWP not as a strong believer, because I am still learning, but more as a supporter. I will help spread the word and be down for another march. *As a young communist I attended my first march on May Day. We were all standing up for our communist ideals holding up banners and red flags and chanting. There were many people watching, but the real experience is in participating, so I encouraged everyone to join the march. I will make sure to attend next year and bring everyone I can. 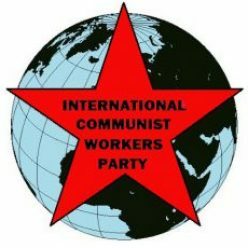 I want to be a member of the ICWP because I believe that we can all make the world a much better place without money, without borders and without jails. *On May 1st, I participated in the celebration of the international working class for the first time. May Day was a success because many people showed up. I met new people and learned about the communist world. Most important, I learned that we’re working together, fighting to have a world with no money, no sexism, no racism, no war and no borders. This was an unforgettable experience. I felt very empowered and confident. I would like to experience this again, and to be the change that I want to see. I consider myself a new member of the ICWP. Red Flag goes to press amidst a furor over US President Trump’s firing of FBI director James Comey. Comey’s comments about ongoing investigations of Hillary Clinton’s email last fall may have thrown the election to Trump. But a few days ago, he made it clear that he was stepping up the investigation of ties between Trump’s campaign and the Russian government. Obviously, Trump fired Comey to obstruct this investigation. Some are comparing this to Nixon’s “Saturday Night Massacre” in 1973, which did not prevent his forced resignation a year later. Incredibly, some anti-Trump activists are rallying to fascist Comey’s defense. They are showing us just how low the lesser-evil” argument can go. Perhaps a better comparison is to the 1934 “Night of the Long Knives” in Germany when the Nazi SS wiped out the Nazi SA. US democracy is no exception to the world-wide descent of capitalism into fascism and flagrant corruption. As the global crisis of capitalism intensifies, rivalries among imperialists sharpen. National politics reflect these sharpening contradictions from India to South Africa to Brazil to the USA. When bosses fight, it’s always a mistake for workers to take sides. Our fight must be for communist workers’ power to wipe out all the fascist bosses. We should take advantage of the bosses’ weakness and disarray. Today I had the great opportunity of participating in the May Day march in Barcelona, Spain. First of all, thank you for allowing me to participate in the distribution of the thinking of those who believe in an equitable world. We will continue believing and continue talking. From the utmost ignorance, without knowing exactly certain dates or names, I can only say that my father has rights, my brother has rights, my daughter has rights and I have rights. And this right is very basic. We have the right to live and to live well. I do not ask nor offer anything that is not possible, much less an illusion. I only ask that we be recognized as human beings. We are not an economic cog in the wheel, much less a disposable part from some factory. We are all equals. I am not a supporter of violent revolutions. I am a dreamer. I believe in peaceful revolution and for this we need people who are informed. An uninformed person is a finger on a trigger. There exist roads and ways, the peaceful path. I don’t want the blood of my son, or any son, in the streets or the tears of some mother or father. Information is the word of consequence, action is the form. Thank you for allowing me to express an idea. Dear distributor, it fills us with inspiration to hear that in spite of some difficulties you were able to carry out productive work to expand communist ideas. In our struggle for communism and against the bosses and their capitalist system, we not only have to confront and destroy the bosses’ ideological weapons like racism, sexism, nationalism and many other tricks that they use to divide the working class, but we also have to fight and destroy those who defend and profit from those ideas. The small concessions and benefits that the workers have today mostly in industrialized countries, have not been because the capitalist bosses or their politicians have decided to share some crumbs with the workers. These small gains have been won through mass violent struggles, like the one that gave life to May Day. History teaches us that the only way to achieve a real change for the working class is through a violent communist revolution. Capitalism will never meet the needs of the working class since for them we are only instruments to produce their wealth. Everything that the bosses have gotten has been through violence against our class, and in the same way the working class will build a new world.